Posted November 7th, 2016 by Sue Peffer & filed under Software. 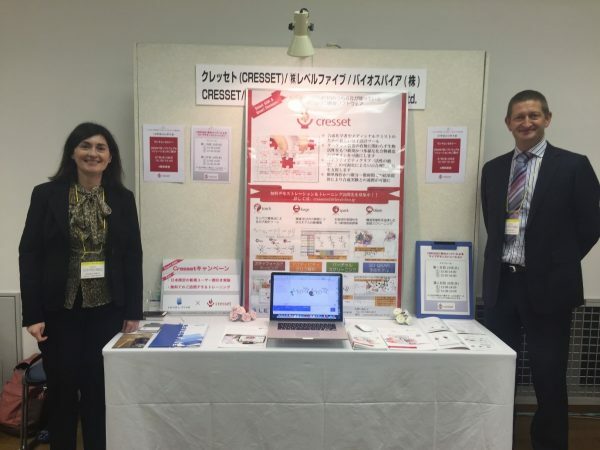 Over 60 delegates attended this seminar, hosted by Cresset and Level Five (Cresset’s distributor in Japan) during the CBI Annual Meeting 2016, Tokyo, October 25th-27th. Dr Giovanna Tedesco presented presented A picture tells a thousand words: Using activity cliffs maps to understand SAR. She focused on the combined use of activity cliffs analysis, as implemented in Activity Atlas and Activity Miner, as a useful method to analyze the Structure-Activity Relationships (SAR) of data sets of different size and complexity. Activity Atlas is a novel, qualitative method available in Forge, Cresset’s powerful workbench for ligand design and SAR analysis. It uses a probabilistic approach to take a global view of the data in a qualitative manner, analyzing the SAR of a set of aligned compounds as a function of their 3D electrostatic, hydrophobic and shape properties. Results are displayed as highly visual 3D activity cliffs summary maps that give an overview of the SAR landscape, focusing on the prevalent SAR signals. Activity Miner, a module of Forge (and optional module in Torch), enables rapid navigation of activity cliffs. It can be used to drill down into the Activity Atlas maps and understand subtle molecule-to-molecule structure-activity changes, identifying potential outliers and giving concrete examples of changes that generate the summary. The information derived from these analyses is an invaluable aid for drug discovery projects that help to inform design decisions and prioritize new molecules for synthesis. Selectivity analysis of adenosine A1, A2a and A3 antagonists through multiple activities. Posted July 4th, 2016 by Paolo Tosco & filed under Science. steric/electrostatic properties, which are what actually determine their recognition by biological macromolecules. In BioBlocks’ Comprehensive Fragment Library (CFL) program, we were confronted with clustering a very large collection of scaffolds generated from first principles. Due to the largely unprecedented structures in the set and our design aim to populate the 3D ‘world’, using the best 3D metrics was critical. The structural diversity of the starting collection of about 800K heterocyclic scaffolds with variable functional group decoration was not adequately captured by 2D ECFP4 fingerprint Tanimoto distances, as shown by the rather flat distribution of 2D similarity values across the set, and by their lack of correlation with the 3D similarity metrics. The initial step of any clustering procedure is the computation of an upper triangular matrix holding similarity values between all pairs of compounds. This step becomes computationally demanding when using 3D methods, since an optimum alignment between the molecules needs be found taking into account multiple conformers. The presentation covers the methodological and technical solutions adopted to enable 3D clustering of such a large set of compounds. Selected examples will be presented to compare the quality and the informative content of 3D vs 2D clusters. See presentation ‘Examining the diversity of large collections of building blocks in 3D‘ as presented at Sheffield Chemoinformatics Conference 2016. Posted August 25th, 2015 by Mark Mackey & filed under Science. See presentation ‘Examining the diversity of large collections of building blocks in 3D‘ given at 250th ACS national meeting. Posted August 25th, 2015 by Martin Slater & filed under Services. A major recent trend within the pharmaceutical industry, particularly noticeable in ‘Big Pharma’ companies, has been the downsizing of internal R&D capacity. This has been both a macro effect – i.e. a strategic decision to reduce the internal R&D costs through doing less internal R&D, and a local effect, i.e. a tactical decision to reduce the internal headcount through outsourcing. The overall R&D effort has not markedly diminished, but an effect of these strategies has been to move a lot of [particularly early-phase] R&D activity into smaller organizations, with a consequent shift in business model to a dependence on in-licensing of candidates to feed the development pipeline. An important aspect of making this transition successful has been the increased adoption of in silico methods to amplify the success of small teams of scientists. The ‘heavy iron’ approaches of the 1990’s and 2000’s (vast combichem libraries, giant compound stores, expensive high-throughput screening robots) have given way to smaller, cheaper and more nimble approaches utilising combinations of physical techniques backed up by powerful computational methods. Cresset delivers cutting edge computational modeling for drug discovery. The key driver for us is excellent science. Our proprietary technology allows very accurate description of the electrostatics of any molecule of interest, be that a potential drug, a piece of protein, DNA, a flavor molecule or an agrochemical. This is delivered within very simple yet powerful drug discovery workflows which combine this unique technology with speed – in other words timescales for computation that are in step with the rate of modern medicinal chemistry. These workflows include high throughput ligand-based virtual screening and scaffold hopping suites. Our customers include many ‘Big Pharma’ companies, but also include a wide range of small drug discovery organisations, biotech companies and agrochemical companies across Europe, US and Asia. We collaborate with academics and research institutions to deliver alternative, more cost effective, drug discovery paradigms for such organisations. Through our contract research organization (CRO) we utilise both our commercial and also our internal research-stage software. These have proven extremely successful across nearly 180 drug discovery projects over a 12 year period. In responding to the changes in business model as described above, supply-side companies like Cresset have also had to adapt – in our case we increasingly deliver a combination of software technology and consulting services expertise. In this presentation we will give an overview, with examples, of the diverse ways in which Cresset has acted as an effective drug discovery partner for its clients – either by delivering software or via outsourced discovery research. See presentation ‘In silico drug discovery outside the traditional big pharma model‘ given at Drug Discovery Re-Invented. We have recently presented a method of summarizing the information obtained from 3D activity cliff analysis: examination of all pairs of molecules can distinguish between apparent cliffs that are outliers, or due to measurement error, and those which consistently point to particular electrostatic and steric features having a large impact on activity. To do this it has proved essential to allow for alignment noise: no 3D alignment technique is perfect, so we apply a Bayesian analysis to correct for potential misalignments and for the case where a molecule is aligned correctly except for a flexible substituent whose conformation is under-constrained. We use the recent AZ/CCDC alignment validation data set to determine valid estimates for the Bayesian priors. As an extension of this technique, it is possible to mine the data for a simple picture of explored pharmacophoric space, corrected for the conformational and alignment flexibility of each molecule. This provides an invaluable picture to the chemist of which parts of property space around a molecule have been adequately explored. When considering a new molecule for synthesis, it is possible to compute the amount that this would increase the explored pharmacophoric space and hence present an ‘information content’ score for the new molecule: if we made and tested this new molecule, how much would it actually increase the structure activity relationship (SAR) information content of the data set? The combination of this, with the activity cliff summary data, allows a simple qualitative evaluation of the SAR of a data set in 3D, alongside guidance on which parts of pharmacophoric space have been mined out and which remain underexplored. We present the application of these techniques to several literature data sets. See presentation ‘Is it worth making? Assessing the information content of new structures‘ given at the 250th ACS National Meeting. Posted May 30th, 2013 by Sue Peffer & filed under Science. Alfred M Ajami, DCAM Pharma Inc. The following presentations have been made available by permission of the presenter. Click the talk title to view the presentation. To be informed about Field Based Chemistry 2014, and other Cresset events, sign-up for our newsletter. Posted May 15th, 2013 by Tim Cheeseright & filed under Science. The spring meeting of the ACS saw Cresset presenting a comparison of Spark, with a quantum mechanical approach NEAT that was published last year, and discussion on the best way to prepare datasets protesting virtual screening and the development of the BlazeGPU. Tim Cheeseright presented a detailed study on the use of Spark for scaffold hopping on Sildenafil. He showed that using the XED force field gave comparable results to those published by Pfizer. He speculated that this was a combination of working in product space and the unique abilities of Cresset’s force field to model aromatic species. The full presentation is accessible below. Tim also presented work that we have been doing on the assessment of virtual screening performance. Mark Mackey is now writing this up as a paper and hence the slides are not currently available. If you would like to discuss our thoughts then please get in touch. Simon Krige presented the work he has been doing on the conversion of Cresset’s core alignment technology from Fortran to openCL. He outlined the many advantages of working in a language that enables code to run on both central and graphics processing units. He showed Cresset’s virtual screening system, Blaze, has been speeded up by a factor of 45 when running on the latest generation of accelerated device for Nvidia. The full presentation is shown below. We will be discsusing aspects of these presentations at our european user meeting in Cambridge, June 20,21, please join us! Posted August 28th, 2012 by Sue Peffer & filed under Science. 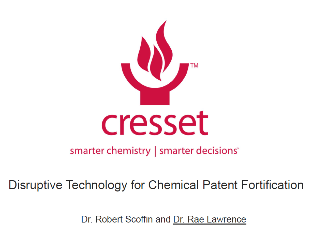 In this presentation, given at ACS Fall 2012, Rae Lawrence discusses how Cresset’s field technology is a great start on the complex road to patent fortification. Do you agree that the results are compelling enough to rethink patent fortification? Posted June 13th, 2012 by Sue Peffer & filed under Science. Our presentation on ‘Fast Computational Method for Fragment Growing and Joining Using Molecular Fields’ by Dr Martin Slater, Director of Consulting, builds on the fragment growing article we published in November 2011. Posted May 8th, 2012 by Sue Peffer & filed under Science. If you missed joining us at ACS San Diego in March, you’ll have another chance to say hello in August when we attend the next ACS meeting in Philadelphia. In the interim, we are delighted to share an ACS San Diego presentation given by our very own Dr. Tim Cheeseright. In this presentation, Tim investigates alternative methods of defining 3D chemical space, and shares the value that molecular fields can add to projects. Assessing the similarity of compound collections using molecular fields: Does it add value? Abstract. The application of chemical diversity in the discovery of novel drug molecules is a contentious issue. The way in which chemical space is often defined – and thus sampled effectively – is by using the 2D connectivity maps of atoms within molecules. These maps can be encoded as numbered features which can be counted and compared. Although this is a particularly effective method on a large scale it has deficiencies. These largely spring from what fundamentally underpins the interaction of a molecule with its biological target, which is not related to the 2D chemical framework but to the 3D interaction of the surface of the molecule via shape and field complementarity. We have investigated alternative methods of defining chemical space using 3D Field based methodologies – the advantages and disadvantages of which we will describe. View more presentations from Cresset. Questions about this presentation? Contact us for further details and discussion, or register to attend one of our free user group meetings for training. We have two meetings in the next few months, so click the links below for more information and registration.